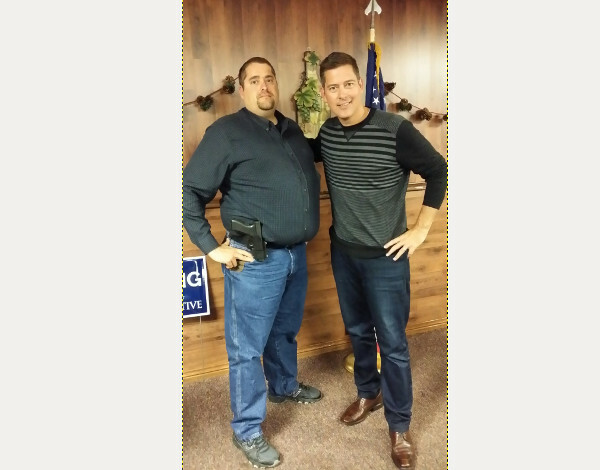 Wisconsin Congressman Sean Duffy was happy to pose with this constituent who was openly carrying at the Rusk County Republican dinner in Ladysmith. Sean told the Badger State resident he felt safer when he had people openly carrying guns around him, because he knew he could trust them. Ladysmith is close to where I was born and raised in northern Wisconsin. The Duffy boys went to school in the same high school I did in Hayward. Sean’s father and I went to high school together. It didn’t surprise me when Sean was elected to fill the seat of the former representative Dave Obey. Obey was a Democrat who ran as a “moderate” and voted far left on everything he thought he could get away with. With the franking privilege and the lack of alternative media back then, that was quite a lot. It’s still difficult to hear a conservative on the media in much of the sparsely populated area. The media is dominated by “progressives,” but the culture is quite conservative. Do you generally support gun-control legislation? I support background checks at gun shows and private sales. I support banning those whose names are on terrorist watch lists from purchasing guns. I wonder if Hoeft would pose for a photograph with an openly carrying constituent. Or not. Never seen a more fitting name for a Democrat. F politicians. Open carry or not. The idea citizens elect people who like gun carry is an abomination to the natural right of lawful self defense. I’m not surprised that a WI pol would be accepting of OC. Wisconsin was an open carry state before it adopted shall issue concealed carry. But, thanks mainly to Madison and Milwaukee, they were very late to the shall issue party. There are times when open carry is appropriate. In rural, suburban and even small town America, people don’t panic and call 911 because they see a “man with a gun.” Being armed is still socially acceptable. The constituent needs to drop some weight. Diabetes, heart disease, and stroke are bad news. Good on him for the OC though, and the Congressman too. I doubt he doesn’t know that. Good on you, internet stranger, for pointing it out though. I want to do my part to help the acronym OFWG refer to Fit, rather than Fat old white guys. I’ve dropped 25 pounds since the first of the year, and can now do 13 chinups instead one one or two like I use to. In the end, we have politicians who believe we are subjects, to be directed and ruled according to their better nature, and those few who believe we are citizens they serve, according to our preferences. The first kind are ever more blatant. At least the other kind are speaking up a little. – You are too crazy, stupid and reactive to be trusted with anything potentially dangerous. And everything is potentially dangerous. – You aren’t worth protecting. Important people and places have their armed guards. You don’t get to protect yourself, because you are just not worth it. – Indeed, if need be, you are simply to be sacrificed for the greater good. It’s not like you get a vote. Oh, right. You do get a vote. It’s exactly as if you counted as much as anybody else. As a fisherman who has spent a good portion of every summer of my life in Hayward, I’m familiar with Sean’s career and hope he continues his success. And I’m glad a TTAG writer calls Hayward home. Good stock there. I was in a coffee shop and a guy was sitting near me with an open carry. I told that is a good idea, he smiled and then I told him, if anything happened he would be the first one shot and I would have time to duck for cover and shoot back. He covered up the weapon. Same goes for unarmed security guards, the BG will shoot the uniform. Open carry but sit so it is hidden. Stand so it is hidden. I’ve been in Walmart behind customers checking out and teh cashier never saw the Glock on the woman’s hip or the 1911 on the man’s wheelchair.